I am not a really big fan of biography. I am interested in history, though, and I am more interested in some historical periods than others. The civil rights movement is a part of history that I do have a pretty strong interest in and especially the civil rights movement in the 1960s. 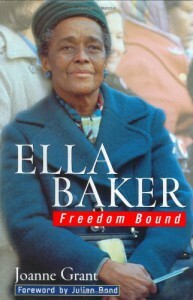 This biography of Ella Baker is a book of history on just that subject. She was born in 1903 and was an early member of the NAACP and all of that history is covered, but the narration becomes a good deal more detailed when the book reaches the late 1950s and the decade of the 1960s. It covers the founding of the SCLC and the SNCC too. Altogether it was quite interesting and educational. My criticism is that it just touches on and skims over the influence of communists on the civil rights movement. I happen to think that is an underrated aspect of the movement that is all too often swept under the rug and this book does its part to sweep the communist participation under the rug too even if it does barely acknowledge it.